CBN Fiber is our best broadband package with connection speed up to 1 Gbps bundled with the first interactive TV in Indonesia. How can I subscribe to CBN Fiber? What are the benefits of CBN Fiber? FTTH (Fiber To The Home) means that we brings the fiber optic directly into your place from our central office. It reaches the boundary of the living space, such as a box outside of your home wall. Some ISPs are still using coaxial cables (also referred to as copper cables) to provide service for homes and businesses, but we are using superior technology: fiber-optic networks. With FTTH, your Internet connection won't slow down, even when the whole neighborhood is online. Fiber optics are significantly faster, providing more secure connection and eco-friendlier than coaxial cable. Some ISP offers unlimited downloads but subjected to FUP, which may impact your internet usage. Fair Usage Policy (FUP) limits the usage of the user. So even though you have a 100 Mbps connection with unlimited downloads, your speed may be heavily limited at peak times and may be slowed down after you have reached the limit of the usage for that month. Our CBN Fiber gives you the truly unlimited service with the maximum speed at all times (no FUP). What is symmetric upload and download? A lot of other ISPs have different upload and download speed, with the upload speed slower usually than the download speed. This may affect your media sharing to social media and Youtube. Our CBN Fiber provides you the same (symmetric) upload and download speed. So, if you subscribe to Fiber 30, that means you will get to enjoy up to 30Mbps upload speed and up to 30 Mbps download speed. Why upload speed is important? Demand for upload bandwidth and speeds is increasing as more customers are relying heavily on online media uploads, cloud storage services as well as running on multiple devices or users. With high upload speed, you can share high upload bandwidth across multiple devices and users to share and upload pictures, videos, and large files to social media or cloud storage simultaneously without compromising your surfing experience. CBN Fiber service administration process will be completed on the same day (excluded Sunday and holidays), after we received the registration form, proof of payment, and a copy of your identification card correctly. Network installation process may take about 7 working days. You will need a wireless router to connect TV Box and use the internet wirelessly. You may use a wireless router, but please note that the connection speed will be divided according to the sharing process and the number of devices that you use. Whether customers can have more than one set Dens.TV Box? How to identify normal conditions of CBN ONU devices? Can customers ask for port forwarding for video surveillance system (CCTV)? 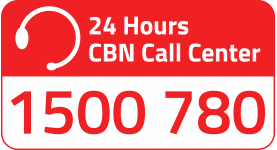 Yes, please call CBN 24 Hours Call Center at 1500780 and state the Local or Private IP Address and port Numbers to be used.